We have published four detailed maps for Portland, and these link up with each other to form a good group for what is almost an island, the Chesil Beach being the only natural link with the mainland. This is an extraordinary group of maps, the quarries given them an almost magical appearance, while a host of railways, inclines, prisons and cliffs give added appeal. Portland is a very special place, and those of us who have spent part of our lives there feel deeply privileged. The Castletown map covers the northern part of the island, and features here include The Mere, Portland Castle, Portland station, Victoria Square, Castletown, cemeteries, Balaclava Bay, naval piers, part of the Easton & Church Hope Railway, Portland Tramway. On the reverse we include part of the 1st Edition map of 1889, showing the original Portland station, Castletown, Royal Breakwater Hotel, New Coaling Camber, Breakwater Branch Railway. The Fortuneswell map climbs upwards and includes Chesil Cove, Fortuneswell centre, Verne Yeates, The Grove, Portland tramway, Nicodemus Knob, St Peter's church (built by convicts) and vicarage (spent part of my childhood here), and numerous quarries: Tout Quarries, Trade Quarries, Inmosthay Quarries, Waycroft Quarries, Withies Croft Quarries, Independent Quarries. Prisons left blank for security, alas, but more than compensated for by wonderful depiction of quarries. On the reverse an extract from the 1st Edition 1889 map of The Grove and this shows many sidings running into Admiralty Quarries behind Grove, leading from Admiralty Incline. The Easton map covers the centre of the island, with what might be termed its town centre, Easton. Features here include St George's church, Easton station, Wakeham, All Saints church, remains of St Andrew's church, Pennsylvania Castle, France Quarries, Rufus Castle, Church Hope Cove, Combefield Quarries, Suckthumb Quarries, Weston, many strip fields, Reforne Street, Easton & Church Hope Railway. On the back we include extracts from a contemporary directory. 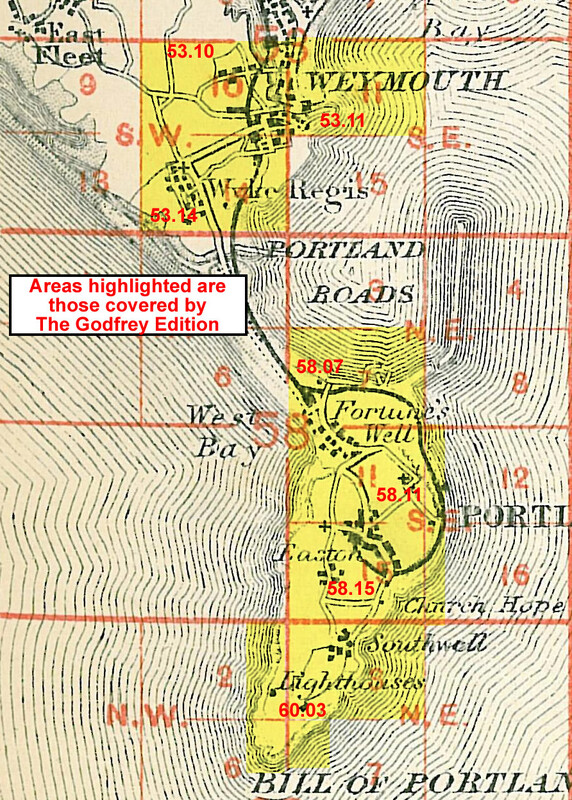 The Southwell map completes the quartet, and is a double-sided map taking coverage right down to Portland Bill. Features here include Southwell, St Andrew's 'Avalanche' church, old and new lighthouses; but this is a more rural map, almost covered with strip fields and with smaller quarries on the west cliff.